The predictable (and predicted) messages of “Why are y’all more upset about a parade than about actual wars” are now showing up on social media. For this reason, I think we need to be very clear. I am against a war parade not because it is uncouth and certainly not because it fails to properly “support the troops” or to properly prepare for more wars, and not merely because it costs money or damages streets (are you kidding me? 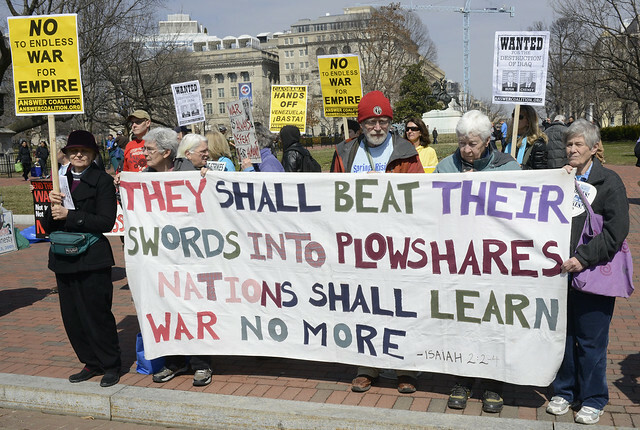 ), but because it makes more wars more likely from the Pentagon and from other nations and groups that see the parade. It stirs up war fever. It encourages fear, obedience, violence, nationalism, xenophobia, racism, and Trumpism. It antagonizes foreign governments and people. It teaches the need to praise both personnel and weaponry regardless of what they have been used for or might be used for. I oppose celebrating the worst thing humanity does to itself, the greatest waste of life and resources, the greatest environmental damage, political damage, cultural damage. People who honestly believe that some wars are necessary are badly deluded but should share my opposition to celebrating war as glorious. Now, can we bottle this outrage? Can we direct it toward a major public display of rejection of militarism in favor of nonviolence and decency? Can we make sure that any images a Trumparade sends to the world are images of a public rejection of war? Can we use this moment, in fact, to build a broader opposition to war among all those who ought to oppose it for stripping them of wealth and security and rights and a livable planet? We have to try! David Swanson is an author, activist, journalist, and radio host. He is director of WorldBeyondWar.org and campaign coordinator for RootsAction.org. Swanson’s books include War Is A Lie. He blogs at DavidSwanson.org and WarIsACrime.org. He hosts Talk Nation Radio. He is a 2015, 2016, 2017 Nobel Peace Prize Nominee. War Is A Lie: Second Edition, published by Just World Books on April 5, 2016. I’ll come anywhere in the world to speak about it. Invite me! Support David’s work. What Banner Would You Carry In The Counter Parade? If Trump wants a #militaryparade, I want us all to hold peace and social justice parades, movement of movement style, in our home towns and communities across the nation. You know, 500+ parades for all the other things we could be doing with our tax dollars. Want to do this? Speak up. Talk to your favorite peace and justice groups, both local and national, about this and let them know you think. Lawrence Wilkerson: An Invasion of Iran Could Be Significantly Worse for the US Empire + Has Trump Launched a New Nuclear Arms Race? This entry was posted in Action Alert, All Posts News Politics and-or Videos, Anti-war, Imperialism, Military, Peace, Politics, Resistance and tagged Activism, David Swanson, Donald Trump, Military Parade, Rivera Sun, Same As It Ever Was. Bookmark the permalink. 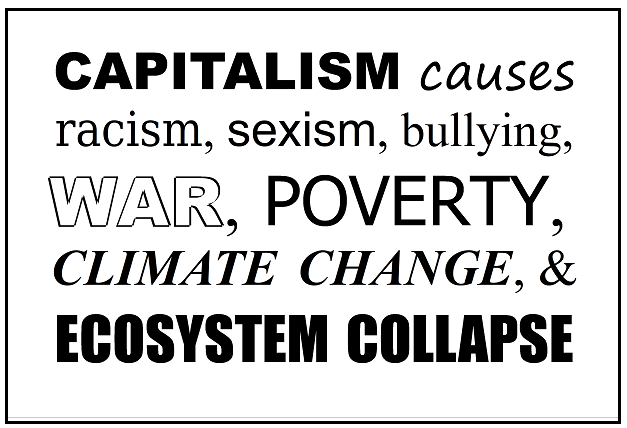 In brief, it says capitalism causes war and a lot of other problems too. Love your poster! Good wishes for your protest.